"Alien: Covenant" is suffering from an identity crisis. It doesn't know if it wants to be another edition in the "Alien" franchise or if it wants to be "Prometheus 2." In 1979, Ridley Scott made a classic film called "Alien." It was a haunted house movie in space, and it was unlike anything that had been made at that point in time. It put the xenomorphs deep in the canon of entertainment popular culture. It created one of the most popular female heroes in the history of movies. Re-watching it, I find it amazing what Ridley Scott pulled off in that movie. How frightening he made it, how he made it almost like a gothic horror film. In the sequel, "Aliens," Ridley Scott bailed and in came in James Cameron. Cameron made a really great follow-up to Scott's masterpiece. But it feels like a massive change to what came before. "Aliens" is incredibly action-oriented, but its still fantastic. There were a couple other sequels to "Alien," made by different directors, and they all felt like inert retreads, adding nothing of substance or entertainment to the equation. In 2012, Ridley Scott finally returned to the franchise he made famous in the first place. He said in interviews over a hundred times that "Prometheus" was in no way or shape an "Alien" prequel, just a movie set in the same universe. "Prometheus" was shockingly philosophical, dealing with creation and who it was that was responsible for it. Yeah, it was also a slow burn horror film that I think worked in more ways than people give it credit for. Yes, I am one of those rare people that actually really enjoyed "Prometheus." Yes, its a flawed film, but so is every film, even the classics. So I can't just write a film off over some flaws, there is so much on the film's mind, and its so confident that I do enjoy the film quite a bit. Ridley Scott once again returns to the "Alien" franchise with "Alien: Covenant." The film takes place ten years after the events of "Prometheus." A massive ship called the Covenant is headed for a planet that can sustain human life. Its a seven year journey to this planet, and the crew is entirely in hibernation sleep. Well of course that gets interrupted by a space shockwave and they all wake up. This accident kills the original captain of the crew (the strangest cameo made by James Franco) and then we learn more about the rest of the crew members. There is Oram (Billy Crudrup) who takes over command, there is Daniels (Katherine Waterston) who is second in command and James Franco's wife and is better suited in leading the team, there is also pilot Tennessee played by Danny McBride. There is also Demian Bichir, Carmen Ejolo, Amy Seimetz, and Callie Hernandez. All great actors, but for the life of me I can't remember their names. 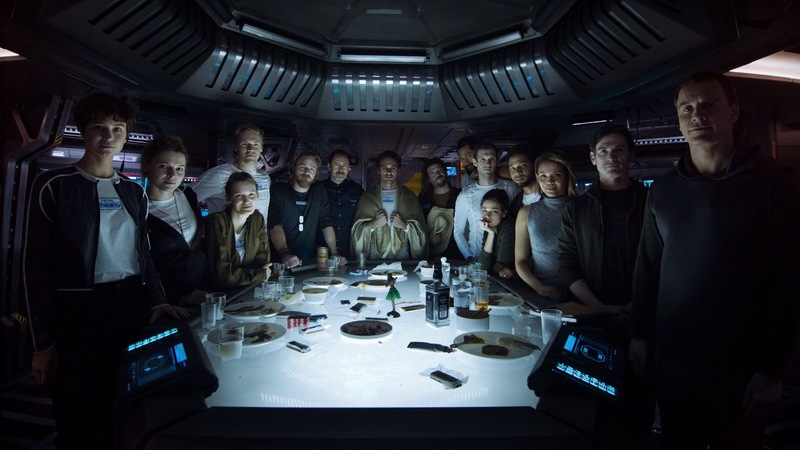 Oh, and of course, it wouldn't be an "Alien" movie if the crew didn't have an android. There is also Walter, played by Michael Fassbender. Now that the crew is awake, they begin to repair the ship, when Tennessee gets a strange recording signal from a nearby planet. They notice that the signal features a human singing a popular song. There is human life somewhere, much closer than the planet they have a set trajectory towards. Oram believes they might as well go and investigate that planet, if it can inhabit life, why not just go and live there? Every body will live happily ever after, right? Well, of course not. The investigation begins, and soon enough people begin to die. This is also the point in time when the movie begins to run off the rails. This being a Ridley Scott movie, its a drop-dead gorgeous film to look at. Scott has proven time and time again that he is an expert at navigating special effects and if you need a reason to see this movie in a theater, go to be absorbed by the world Scott creates. With the cast assembled for this one, obviously the film contains great performances, especially by Michael Fassbender and surprisingly by Danny McBride. That is all good and well, I just wish this work was in service of something that wasn't such a mixed bag. But when David, the android from "Prometheus," also played by Fassbender, shows up, dressed in the same outfit he wears in "Assassin's Creed," things go off the rails as I suggested. I think Scott's goal was to bridge the gap between his "Alien" movies and "Prometheus." But it seems Scott struggles with this and wants it both ways. He tries to make a sequel to "Promtheus," but fails to answer any of the questions from that movie, and only piles on other movies. He also decides to over-explain the xenomorphs. I am of the mind that less is more, I don't need to know where the xenomorphs came from. The untold history of how the xenomorphs came into being lands with such an immense thud that I can't believe this came from the guy that gave us the original "Alien." The exposition is laid on so thick that it comes off boring. On the other side of the coin, he tries to make a conventional "Alien" movie, and it just doesn't feel the same. While I will say that I really liked the special effects, I don't think they look good when it comes to the xenomorphs. Its amazing how puppetry and animation was more convincing and scary than world class CGI. The aliens look so fake in this movie that it took me out of the experience several times during the movie. Its also just not that scary as a film. There is a big moment in the middle of the movie, and at first, I loved the scene it was creepy and disturbing, but as it continued, I couldn't believe this horror scene was punctuated by slapstick hilarity. When an auditorium of movie goers are giggling at the end of a sequence meant for horrors, something has gone completely wrong. Then there is the "big twist" at the end. I put that in quotes because I am sure there are going to be people who hastily defend this ending, but I found it to be quite ridiculous. First of all, the screenwriters weren't clever at all, because I saw it coming a mile away, as I am sure the rest of the audience did as well. Second of all, it was just a stupid storytelling moment. I feel like I am being overly harsh on this film and what's weird about admitting that is I liked watching individual moments and scenes in this movie. Just when you try and connect those scenes and moments to an overall story, it really looses me. This movie is full of beautiful imagery and great performances, but those performers are playing dumb characters who make dumb decisions (something I think "Prometheus" was wrongfully accused of), and it is also filled with unnecessary story beats that end up not making a lot of sense. "Alien: Covenant" is fun to watch at times, and at others its infuriating. I plan to revisit this in a couple weeks, to really dive into the film's spoilers.